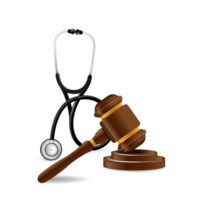 What Constitutes Medical Malpractice In Florida? Foreign object left inside a patient after surgery. All health care professionals are legally required to treat their patients with care. Under section 766.102 of the Florida Statutes the prevailing standard of care that a medical professional owes to his/her patent is defined as the “level of care, skill, and treatment which, in light of all relevant surrounding circumstances, is recognized as acceptable and appropriate by reasonably prudent similar health care providers.” In order to prove that this standard of care has been breach the claimant will generally present evidence from medical experts indicating what a prudent and similarly situated medical professional would have done given the circumstances, and then illustrate how the defendant’s actions deviated from the prevailing professional standard of care. Next, the claimant must show that the defendant’s breach of the applicable standard of care was the proximate cause of his/her injury. In other words, the claimant must demonstrate that if it were not for the defendant’s negligence the injury at issue would not have occurred. Lastly, the claimant must establish the damages that they have suffered as a result of the defendant’s malpractice. The claimant does this by providing evidence of the monetary amount necessary to replace what was lost (known as economic damages), plus any applicable non-economic damages that they suffered (for example, pain and suffering, inconvenience, etc.). If you have questions about filing a medical malpractice lawsuit in Florida the Mander Law Group is here to help. Medical mistake cases come in a variety of different forms but our team of experienced medical malpractice attorneys handles them all. From birth injuries to misdiagnosis and wrongfully performed surgeries we are committed to holding medical professionals responsible for their negligent mistakes and fighting for the compensation that our clients are legally entitled to. To discuss the possibility of filing a medical malpractice lawsuit during a free initial consultation contact our Dade City office today at (800) 557-0411.